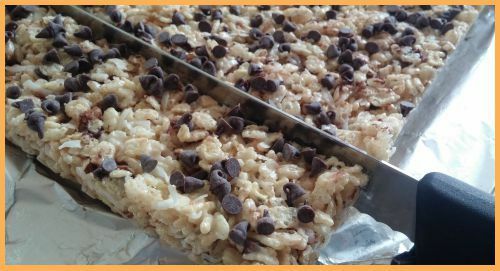 Chocolate Chip Rice Krispie Treats are an easy variation to the classic homemade Rice Krispie Treats recipe. This version includes a twist: miniature chocolate chips added to both the cereal mixture before it sets and then pressed into the surface of the cookies. You can also add a cup of unsweetened shredded coconut to the mixture. The coconut is optional – but it’s really, really good. It makes the treats taste like Mounds® candy bars. It’s an easy cookie recipe you can make with kids. It’s also gluten-free. You can also read fun Rice Krispie Treats trivia here. Line a 13 x 9 baking pan with foil, allowing the ends of the foil to drape over the ends of the pan. Spray the foil lightly with cooking spray. Measure ½ cup miniature chocolate chips. Set aside. Set butter and marshmallows in a large, microwave-safe bowl. Microwave on high for 1 minute. Remove the bowl from the oven and stir. Return bowl to the oven. Microwave in 30-second increments, removing the bowl and stirring the marshmallow mixture each time until it is smooth. When the marshmallow mixture is ready, pour it into the rice cereal mixture. Stir quickly, combining thoroughly to coat the cereal. As the coated cereal cools, the melted marshmallows will begin to look stringy. At this point, fold ½ cup miniature chocolate chips into the coated cereal. With a piece of waxed paper or wet fingers, press the cereal mixture in the prepared baking pan. Flatten the cereal evenly in the pan. Sprinkle the remaining ¼ cup miniature chocolate chips evenly over the surface. Press the chips into the cereal. Lift the foil ends to remove the bars from the pan. Set the bars on a cutting board. Peel back the foil. Use a long bread knife to cut the bars into 2-inch squares. You can substitute 10 ounces of miniature marshmallows for regular marshmallows. For best results, use fresh marshmallows. Be sure to wait to add the miniature chocolate chips to the cereal mixture until the melted marshmallows have cooled slightly. If the marshmallows are too hot, the chocolate chips will melt. 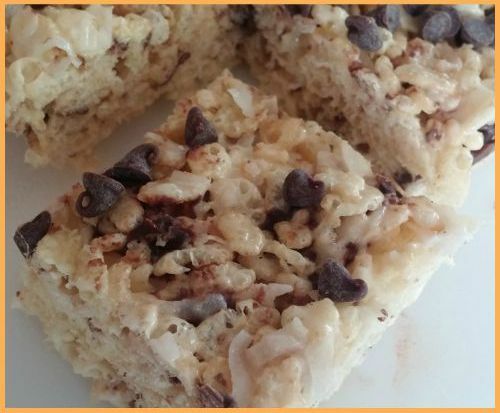 Check out The Elf's Rice Krispie Treats Pinterest Board.